Starting a new journey is never easy. There are a million hoops to jump through before you actually feel successful. Creating new habits isn’t easy, either. Here are six simple hacks that will make it a little easier. Use them until you’ve internalized the new habit and don’t need them anymore. How long will it take to stick to my new habit? Tips here! Schedule your new habits or make them part of your daily to-do list until they become something you do automatically. The first few days are always simple easy, because you just started and you're excited to do it, and you're excited to eventually see results. It's when those results don't come overnight that our energy tends to wane. You may even go as far as sharing it publicly on Facebook or write a blog about your new journey, like me (if you do this, leave a comment so I can read it!). Knowing that others read it and know about it might be just enough to keep you going when you feel like throwing in the towel. When I was struggling with finding time for blogging, I posted about it on Facebook and received countless messages telling me what I say matter to them, and they like when I post. It was SO heartwarming a few days ago when a friend of mine told me a post of mine helped encourage her to drink more water. So make it public, you never know when something you say or strive for will help someone around you. 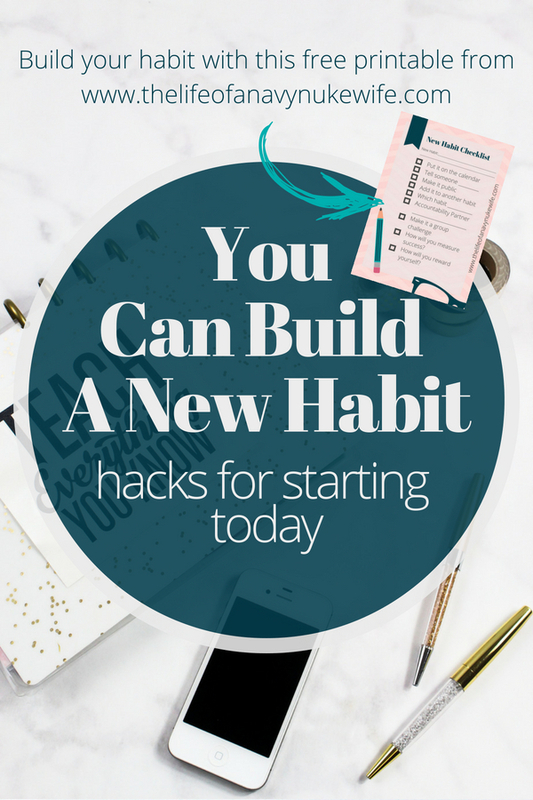 Whenever possible, add the new habit to one you already have. For example, if you always start dinner at 4pm, and you want to get in the habit of taking a daily walk, make the new ritual to go for your walk and then come back and start dinner. Hooking your new habit onto already established habits will make you much more likely to remember. It’s much easier to amend an existing habit or ritual than creating an entirely new one. My favorite task to add things to is my cup of coffee in the morning. When I get to enjoy my coffee all alone in sweet silence, I put together my to do list, and enjoy the benefits of single-tasking and being crazy productive. Find someone with the same or similar goal. I call these accountability partners. Find a friend who is eager to make progress in their own life, and succeed together. Not only will you work harder because you want to improve, but you'll be reminded by them each day (or maybe you'll remind them!). My friend Becca is my go to accountability partner. We have joined yoga challenges, learned to eat better together, and done Pilates challenges together. Did I mention she lives a thousand miles away from me? Accountability partners don't have to be your neighbor (although that's fun too! ), they just have to have your phone number. Keep tabs on each other and encourage each other to keep going. It’s much harder to skip a walk or work out if you know someone else is depending on you being there.